So, the odd thing about this is the timing. Right now Michael Miller and many Modern Quilt guilds are doing a Madrona Road challenge. Mine... does not qualify. It's the wrong color scheme for one thing! I love the wild carrot print in this line - but because it is a large print, I decided to use it in blank blocks as well as in the pieced block. Most of the other fabrics are from Madrona Road as well - but there are a few off prints - there is one grey fabric that is not Sprout, there is one brown floral that is not Sweet Field, there is one blue that is not Haystack, but a Sketch print. And one block just has white rather than Wild Carrot. I also pieced one of the blanks, but that was because an all white one looked weird, and I was out of big pieces of Wild Carrot. 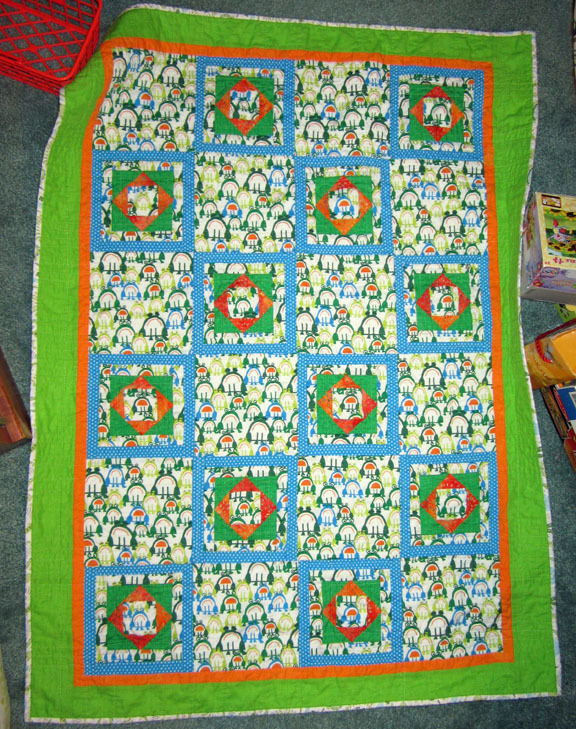 And the back - is orange Haystack and Wild Carrot leftovers, and then some Oliver and S. fabric that was a similar orange (but I only had a yard of - not enough to make a whole back). 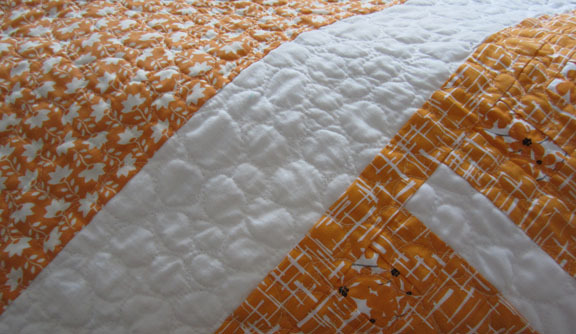 I added back some selvage strips to keep the name of the fabric, which the quilt shares, with the quilt. The binding is Sprout in blue - I seriously love this particular shade of blue! This quilt was finishing up as I received my copy of Angela Walter's book Free Motion Quilting, an amazing book I have been recommending to everyone since then. It really took me from a reluctant quilter to someone who is eager to practice and explore the potential of That Side of the craft. 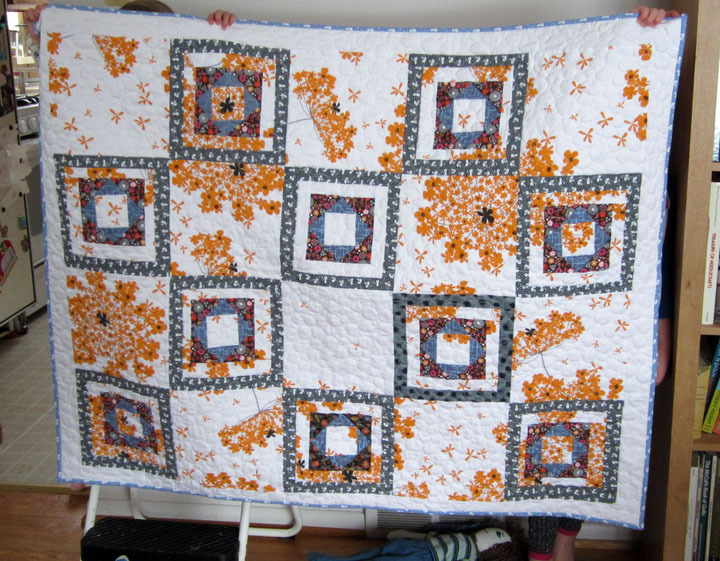 I have made another quilt with this same floating windows design. This seems to me the perfect answer for large print fabrics as well as big statement fabrics that you don't want to cut entirely to bits. Also, by fussy cutting the center block of the pieced block you can focus in on your favorite part of the print in an interesting way. This one is baby blanket as well, but the scale is different, these are 8 inch blocks, and the Madrona Road was 9 inch blocks. I love this frog print from Ed Emberley's Happy Drawing collection! I also used Sketch here (both the "solid" greens are Sketch), which is an amazing blender, if you are not familiar with it... you can get it from Pink Castle Fabrics (which is where I got it). And the back is a solid piece (much easier) of ta dot in lime green. 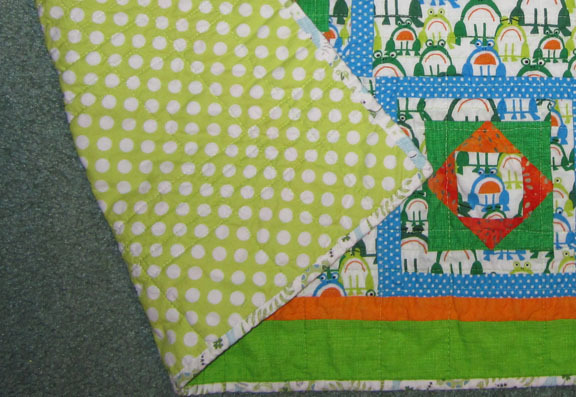 The quilting is just a simple grid pattern, and the binding is frogs and ants and snakes in similar colors.